The SpeedNews Aerospace Manufacturing Conference will bring together the leaders of major manufacturers and suppliers in the aerospace industry to discuss manufacturing capabilities and processes, best practices, manufacturing technological innovations and automation, advanced materials and industry trends. The Conference will also focus on various manufacturing aspects including: tooling, machining, structural elements, engine components, design, and engineering. Delegates will be updated with the latest products, to improve the productivity and profitability for their operations. 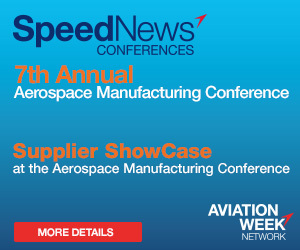 The SpeedNews Aerospace Manufacturing Conference will provide company presidents, vice presidents, directors, C-level executives, general managers, procurement, production, sales and marketing, R&D, engineers, investment, and quality control professionals, the opportunity to network and gain a full understanding of the aerospace manufacturing industry. The SpeedNews Aerospace Manufacturing Conference will provide delegates with the opportunity to network and gain a full understanding of the aerospace manufacturing industry.